Those wanting a more powerful version of the two-door Subaru BRZ will have to wait longer. Subaru just announced their line-up at the Tokyo Auto Salon 2017 and while the show itself is worth a visit (check our 2016 experience here and here), there’s still no turbocharged BRZ in sight. 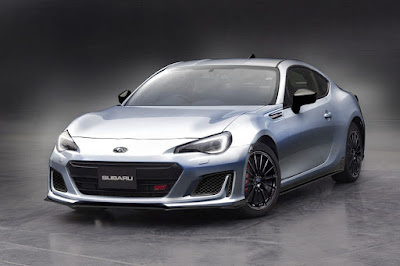 What Subaru is showing instead is the Subaru BRZ STI Sports Concept, a car that clearly takes its inspiration from the wild BRZ STI Concept shown a year back. The parts shown on the “concept” will eventually form a catalogue of look-faster, corner-better parts for the BRZ. Beside the Subaru BRZ STI Sports Concept, the brand will also show the WRX S4 STI Sport Concept (same thing as the BRZ but this time, the formula is applied to Subaru’s iconic sports sedan). Interestingly, the booth will also showcase the all-new Impreza decked out in STI Performance parts as is the Levorg STI Sport -STI Performance- (yes, that’s the official name) which was shown as a, you guessed it right, concept a year ago. The Tokyo Auto Salon 2017 will run from January 13 to 15, 2017 at the Makuhari Messe in Chiba, Tokyo.